Step aboard the Peggy's Cove Express where you will be welcomed by your crew of friendly and fun-loving Haligonians, who know exactly when and where to boat for the very best fishing locations. 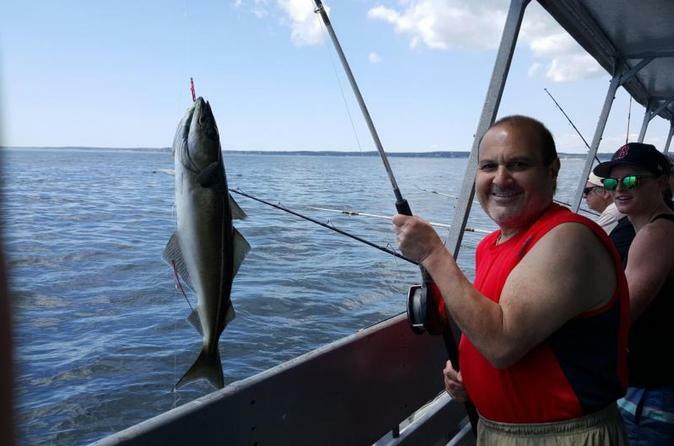 With all bait and equipment supplied, your three-hour tour plots its course out the mouth of the harbour into the North Atlantic in search of cod, haddock, mackerel, and Boston bluefish. Once the fishing grounds are reached, all you need to concern yourself with is catching fish! With the stunning views of the Atlantic Coast, this will be an adventure you will never forget. Join our knowledgeable Captain and crew for an experience you will not soon forget. Once you have boarded, our Lead Deckhand will go over the important safety rules and then tell you all about the fishing industry in Nova Scotia on our way out to the best fishing grounds in the area. Fishing experience is not necessary to enjoy this tour or to be successful if you are trying to catch yourself some supper! You will be shown how to use our equipment, there is no need to bring any of your own. On the way out of the harbour, you will learn about not only the fish you will be looking to catch, but also about the city and history of the Halifax Harbour. Once we reach an active fishing location (the Captain can always tell where and when they are biting), we cut the engine and give you the chance to relax and have fun reeling in the native species of this region. You have the option of either keeping your catch (as long as it is the minimum size allowed by law), or releasing it back into the wild. This is a three hour tour, and once it is time to turn around and head back to the wharf, the Lead Deckhand will assist you in gutting and cleaning any fish you would like to take home with you. We provide ice and packaging for you to take your cleaned fillets with you. Whether you are a local or visiting from away, this is a true Nova Scotian experience that is a great time for all ages.